Jaffna News: The police filed a lawsuit in the Jaffna Judicial Court today against a young female attorney who wearing sunglasses. The court gave approval to the police to grant the permission of the Attorney General to prosecute the woman's attorney and filed the case on January 14. On the last of the 12 th, a female attorney was searched into a Jaffna court complex on charges of wearing a sari foil. There was a dispute in the Jaffna court complex. The attorney told the attorneys that the attorney had to be taken to the police station. However, the solicitor sought by the police returned home from the courthouse. In this case, the relevant attorney for visiting the court premises was held in Jaffna. President's lawyer, Chanda Abhimussingam, brought the affidavit to the Jaffna Police Station. 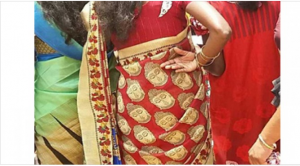 However, the female attorney went to the police station and did not wear saree with the figure of Buddha. "I was offered a sari by a friend in India. I do not know that Buddha's image is engraved. I do not wear that sari in the thought of dishonoring the Buddha, "the young lady attorney said in her statement. The decision was taken from the action taken by the Buddha in the form of a sari attached to the Jaffna Attorneys' Association and the Police Superior. However, two days after the incident, the girl's attorney was taken into the court premises and the issue of the camera taken by her police officer was taken seriously. The allegation that the woman's lawyer was threatened by the police was handed over by the police officer's cell phone. The Jaffna Attorneys' Association has decided to take appropriate action on this violation of the police. The association is also investigating the case against a female police officer.